Therapeutic Massage - Available all year! Please book ahead! Our therapists are in great demand during the peak season, they are that amazing! We have limited timeslots to allow for you & our therapists to thoroughly relate & create a personalized experience. Therapeutic massage involves the manipulation of the soft tissue structures of the body to prevent and alleviate pain, discomfort, muscle spasm, and stress; and, to promote health and wellness. AMTA defines Massage as, "a manual soft tissue manipulation that includes holding, causing movement, and/or applying pressure to the body." Massage therapy is " a profession in which the practitioner applies manual techniques, and may apply adjunctive therapies, with the intention of positively affecting the health and well-being of the client." (AMTA) Massage therapy improves functioning of the circulatory, lymphatic, muscular, skeletal, and nervous systems and may improve the rate at which the body recovers from injury and illness. Massage involves holding, causing movement of soft tissue, and/or applying pressure to the body. So what does getting therapeutic massage mean? Therapeutic massage is designed to relieve severe tension in the muscle and the connective tissue or fascia. The massage focuses on the muscles located below the surface of the top muscles. Deep tissue massage is often recommended for individuals who experience consistent pain, are involved in heavy physical activity, such as athletes, and patients who have sustained physical injury. At Banyan Tree, our massage therapists use a variety of massage techniques to help the client work on a specific problem, whether it’s a sore hamstring, frozen shoulder, or intense stress. This may differ from a relaxation massage, where the therapist uses lighter pressure to help reduce stress and will likely provide a general, all over massage rather than targeting specific problem areas. Both are great; it’s a matter of what you want or need that day. Deep tissue/therapeutic massage uses a variety of modalities to achieve the goal, including (but not limited to) Swedish, trigger point, and myofascial techniques. Because the therapist is working so deeply, it is not uncommon to feel a little sore after the massage, and in some cases to experience bruising. Often the therapist won’t know if they’re working too deep unless you say something. Open communication is critical. Every day your body is different, so what feels good one day may hurt the next. And, what one person calls deep tissue another will call light. The most important thing is that you feel comfortable during your massage. How Often Should You Get Massage? Most people do well on a monthly schedule for their therapeutic massage, but how often you should do it depends on what is going on with you physically and your budget. We often see clients who come in weekly for a few months to address a specific problem, and then switch to a monthly schedule.What we do know is that once or twice a year is not frequent enough for you to see the long-term, positive benefits of incorporating massage therapy into your wellness routine. To see sustained benefit, six weeks is really the maximum amount of time you should go between massages. Enjoy a therapeutic or relaxing massage in our private massage room. Our therapists are experienced and come highly recommended from island residents and guests. Specialty trainings include, Deep Tissue, Range of Motion Techniques, Trigger Point, Reflexology, Relaxation. Additional charges for time and specialty may be discussed prior to your scheduled massage, on a need basis only. Indulgent and uniquely relaxing, our signature full-body massage stimulates circulation and soothes tight muscles. Our gifted therapists adapt their eclectic techniques to your particular needs and preferences. Tension dissolves, leaving only comfort and well-being behind. Deep Tissue Massage, this is deep, strong and specific bodywork, therapist and client work together to create change. Deep tissue massage therapy is similar to Swedish massage, but the deeper pressure is beneficial in releasing chronic muscle tension. The focus is on the deepest layers of muscle tissue, tendons and fascia (the protective layer surrounding muscles, bones and joints). A study in the Journal of Alternative and Complementary Medicine found that people's blood pressure fell after a single 45 to 60 minute deep tissue massage. Additionally, a 2010 meta-analysis in the Journal of Clinical Psychiatry found that massage modalities like deep tissue reduce stress hormone levels and heart rate while boosting mood and relaxation by triggering the release of oxytocin and serotonin. Please talk with your professional massage therapist to see if a deep tissue massage therapy would be beneficial for you. Traditional Thai Massage, Our Nicole is a professional...therapists must attend hours of training & have intuitive body awareness. Thai massage, sometimes called "yoga massage," originated in Buddhist monasteries as preventive health care for the monks. Using slow, gentle rocking movements, the therapist applies compression with thumbs, palms, elbows, knees and feet to stretch soft tissues and harmonize vital energies. This graceful therapy, which is given on a futon, leaves you relaxed, energized and more flexible. Please wear loose, comfortable clothing. Excellent for bodies with special conditions leaving them extremely tight either from past injuries or Parkinsons. Therapist assists the relaxation and allow the client's body to adjust slowly into a deeper sense of release. Get ready to relax and renew your body with our 45 min. Organic Body Glow Sugar Scrub with warm-hot towel treatment and light body brushing to exfoliate yet moisturize skin to a soft buttery feel, follow this aromatic and soothing service with 30 Minutes of tension releasing therapeutic massage. Makes a Great Healthy Gift for that special someone! I am Nationally Certified and Florida Licensed since 2001. I customize each massage session according to my client's needs utilizing my own intuition and various techniques that I have learned throughout the years. 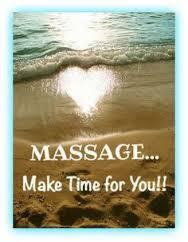 I practice Swedish, Deep-Tissue, Bamboo-Fusion, Hot Stone, Reiki, Reflexology, and Thai Massage. I also offer a Sugar Scrub treatment on Tue, Wed & Thu, a great complement to any massage by request, prior to your appointment. I welcome you to take at least 1 hour out of your day and allow me to help quiet the mind, tune in to your body, relieve the tension, and feel good! My massage is Holistic. Body, Mind and the Spirit. The balance of energy flowing from these three aspects of each person is the desired effect. Daily stresses can cause tension to be stored in our bodies. My massage stimulates the energy points in the body through Deep Tissue Swedish Massage. I also include Shiatsu/Acupressure Point Therapy, Neuromuscular Techniques, MyoFascia Release, Thai Massage and Passive Stretching, according to each individual’s specific tolerance. I encourage the receiver to take responsibility for his/her own state of health, thus becoming an equal and active partner in the massage. Body awareness, a feeling of high energy, during and after the massage can be experienced. Because of the variety of techniques, my massages last 90 minutes.